The following instructions are provided for Ubuntu. These steps may differ from other distributions of Linux. 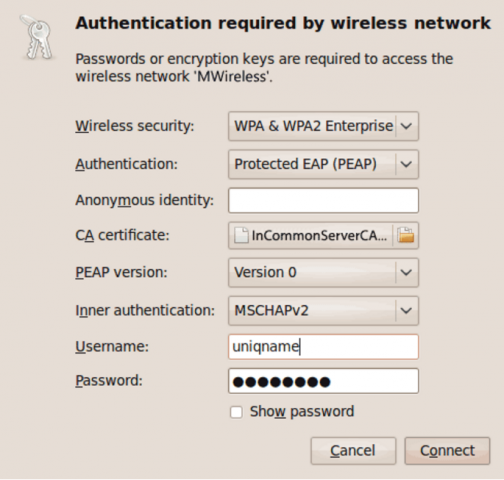 Consult the help documentation of your distribution for instructions on setting up a WPA2-Enterprise connection, and see the Unsupported Devices page for additional details. Acquire the InCommon certificate file. Save the certificate file to a location where it will not be deleted (e.g., ~/ or ~/Documents/). It will be needed for subsequent connections. Some Linux distributions require the top level root Certificate Authority CA certificate instead of, or in addition to, the intermediate CA certificate that was used to sign the RADIUS server certificate. In this case, visit UserTrust to obtain the root CA certificate. 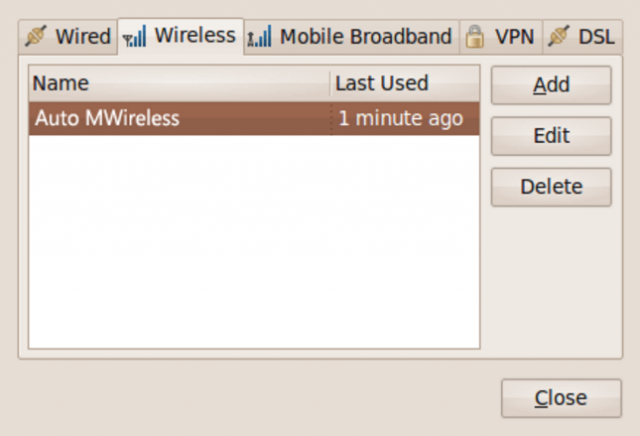 Right-click the Network Manager icon to verify that Enable Networking and Enable Wireless are selected in the drop-down list. 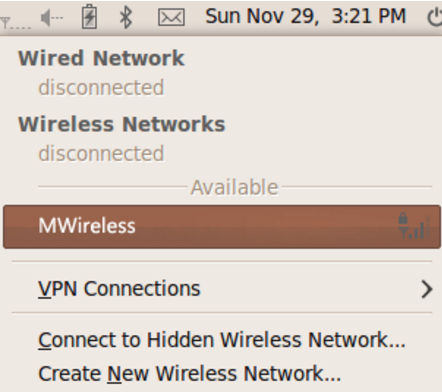 Click the Network Manager icon and select MWireless or eduroam. You should now be connected to the WiFi network. You must have root privileges on your computer to successfully complete these steps. It may be necessary to turn your wireless connection off and back on in order to connect the first time. Make sure you have installed all available driver updates and patches for your Linux installation and your wireless device (check the wireless card manufacturer's web site for the most current driver updates). Right-click Network Manager, and select Edit Connections. 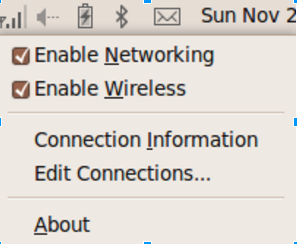 Click the Wireless tab, select the connection you configured, and click Edit . 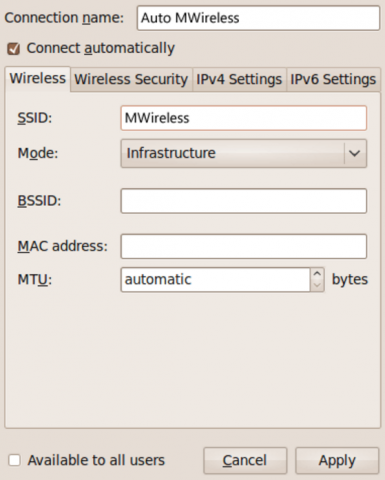 Verify that the Connect automatically box is checked. 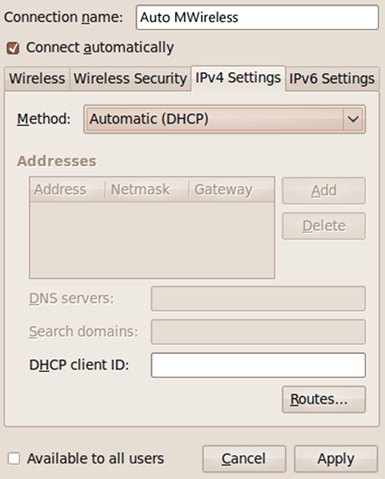 Click the IPv4 Settings tab, and make sure Method is set to Automatic (DHCP). Click Apply, then Close in the Edit Connections window.